Screens specifically designed for use in video walls usually have narrow bezels in order to minimize mullion, the gap between active display areas, and are built with long-term serviceability in mind. Such screens often contain the hardware necessary to stack similar screens together, along with connections to daisy chain power, video, and command signals between screens. A command signal may, for example, power all screens in the video wall on or off, or calibrate the brightness of a single screen after bulb replacement. 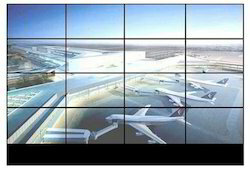 Video walls are sometimes found in control rooms, stadiums, and other large public venues, such as Oakland International Airport's baggage claim, where patrons are expected to observe the display at long distances. Video walls can also benefit smaller venues when patrons may view the screens both up close and at a distance, respectively necessitating both high pixel density and large size. For example, the 100-inch video wall located in the main lobby of the Lafayette Library and Learning Center has enough size for the distant passerby to view photos while also providing the nearby observer enough resolution to read about upcoming events. Simple video walls can be driven from multi-monitor video cards, however more complex arrangements may require specialized video processors, specifically designed to manage and drive large video walls. There is also new software-centric video wall technology that uses ordinary PCs, displays and networking equipment. Looking for Video Wall ?